Highly interesting William H. Taft letter signed, with additional autograph note signed (and hand-annotations), on a range of subjects, including Theodore Roosevelt's possible nomination as President in 1916, and also Taft's own possible appointment to the Supreme Court, which ''does not excite the slightest curiosity or interest on my part.'' Nevertheless, Taft spends most of the letter discussing it, and encloses a letter of recommendation prepared by dozens of lawyers in support of his nomination. 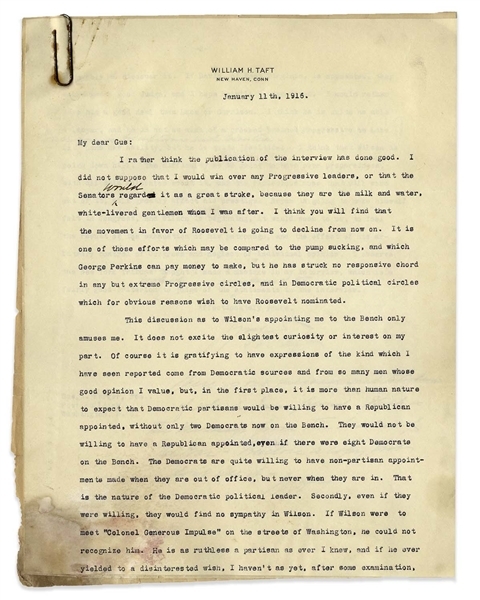 Written to Taft's friend, journalist Gus Karger on Taft's personal stationery, letter dated 11 January 1916 reads in part, ''...I think you will find that the movement in favor of [Theodore] Roosevelt is going to decline from now on...he has struck no responsive chord in any but extreme Progressive circles, and in Democratic political circles which for obvious reasons wish to have Roosevelt nominated. The discussion as to Wilson's appointing me to the Bench only amuses me. It does not excite the slightest curiosity or interest on my part. Of course it is gratifying to have expressions of the kind which I have seen reported come from Democratic sources and from so many men whose good opinion I value, but, in the first place, it is more than human nature to expect that Democratic partisans would be willing to have a Republican appointed, without only two Democrats now on the Bench...The Democrats are quite willing to have non-partisan appointments made when they are out of office, but never when they are in...Secondly, even if they were willing, they would find no sympathy in [President Woodrow] Wilson. If Wilson were to meet 'Colonel Generous Impulse' on the streets of Washington, he could not recognize him. He is as ruthless a partisan as ever I knew, and if he ever yielded to a disinterested wish, I haven't as yet, after some examination, been able to discover it...Davis, of West Virginia...is not as much of a crooked brained Progressive as Lane is. [handwritten] Garrison is bumptious and limited. Lane has ability, but he is quite jesuitical. I think that Wilson is going down hill. The difficulty he is going to have over preparedness, with all this hulabaloo about it, and the ridiculous muss that will come out of it, will greatly affect his prestige. Bryan is going to make himself felt in Congress, and Wilson is beginning, it would seem to me, to feel the result of the exhaustion of his patronage, and the effect of his arbitrary control of Congress and neglect of individual opinion...[signed] Wm H. Taft''. 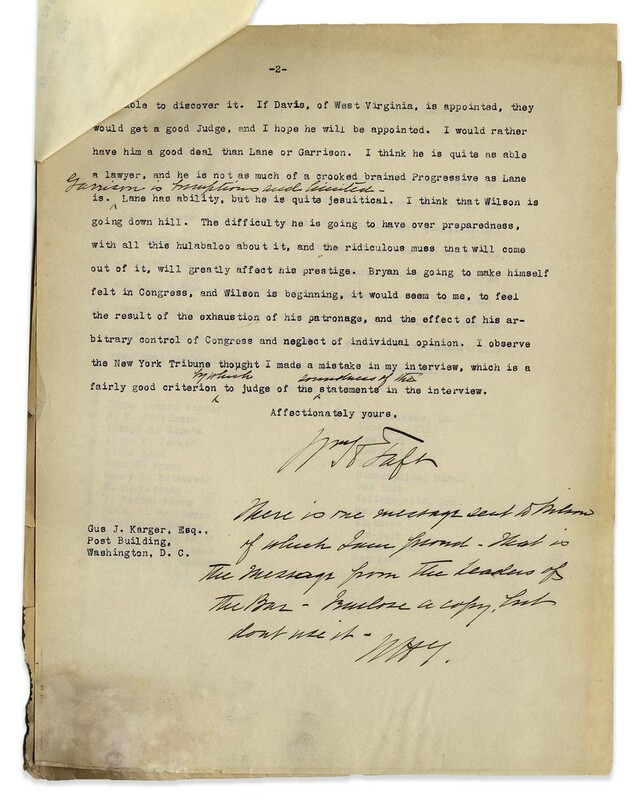 Taft then adds a handwritten note, ''There is the message sent to Wilson of which I am proud. That is the message from the Leaders of the Bar - Enclose a copy, but don't use it - WHT.'' 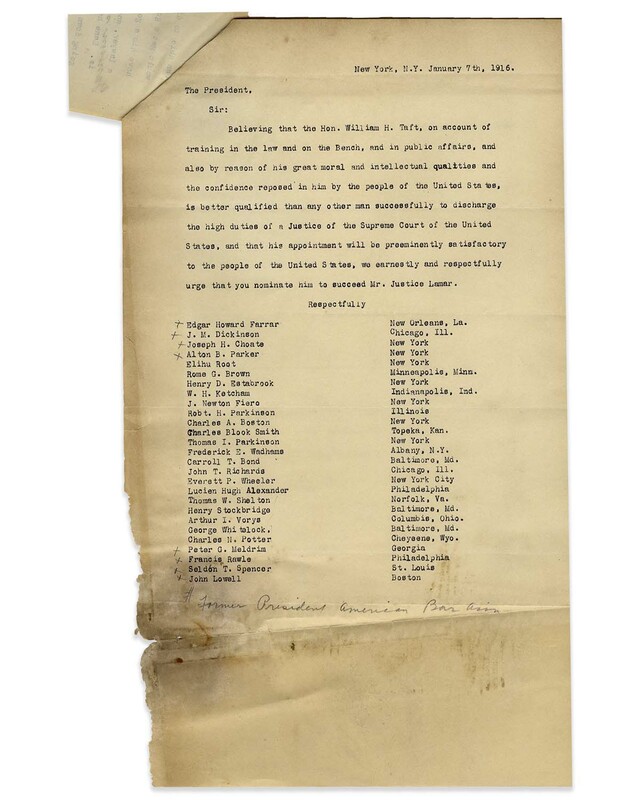 This sheet remains with the letter, dated 7 January 1916 and addressed to the President, with the names of dozens of lawyers in support of Taft's nomination. Two page letter, on two separate sheets, measures 8'' x 10.5''. Third sheet measures 8'' x 13''. Some dampstaining at bottom, rust from paperclip and uniform toning. Overall in good plus condition. 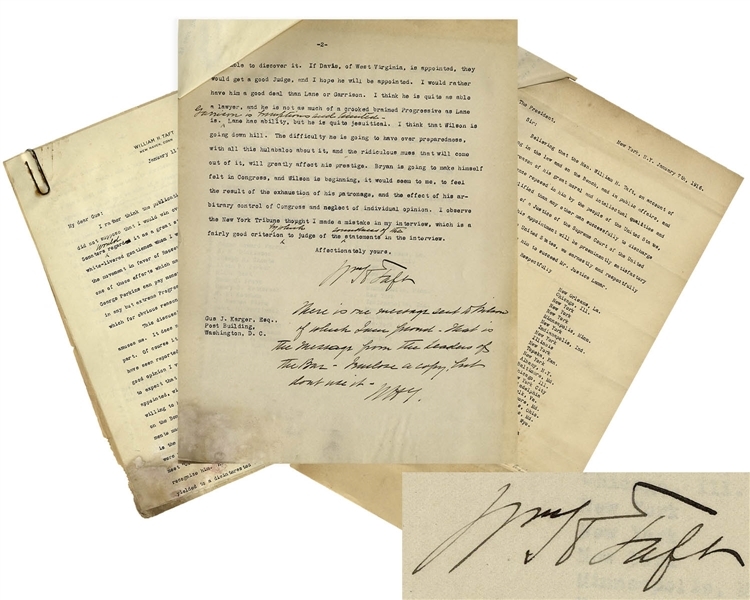 William Taft would eventually be nominated to the Supreme Court in 1921 by Republican President Warren Harding, and served as its Chief Justice, the only President to have also served on the Supreme Court.